Boulder is home to many unique businesses, and food based products are no exception. There are at least 3 granola companies based in Boulder, and a few other companies, such as Udi’s, based in the greater Denver area. Granola is classified by some as a super healthy food made with natural, healthy ingredients (maybe even considered bird food to some). To others, granola may be seen as a high calorie, sugar and fat processed food that should be limited in consumption. How do the Boulder granola companies stack up nutritionally and in ingredient quality to other granolas? Fiona’s has been on the market the longest of Boulder granolas, starting at the end of 2001. The idea of selling granola came to Fiona one day when she was going through a tough transition from a divorce, starting a full time job with the chamber of commerce and trying to raise and support her then 3 year old daughter. She wanted to devote more time to her daughter, and the idea struck her of starting to make and sell her mom’s granola. Her mother made granola for their family growing up, and Fiona started making it herself when she was 14 years old. Friends and relatives would ask her all the time to make it for them on special occasions. She decided to quit her full time job, dig out her mom’s recipe and start making and selling granola. She didn’t know anything about the business of starting a company, but “Things just fell into my lap”, as Fiona puts it. Success happened fast and furious for Fiona’s granola, and she had her granola in Whole Foods within 6 months of starting. Fiona’s Granola now comes in 6 varieties, 2 quinoa gluten free varieties (3rd gluten free granola coming soon) and 3 raw mueslis. Fiona, a naturally creative chef, came up with all the granola flavors and has expanded to also creating energy bars, savory roasted nuts and trail mixes. Fiona’s products are in numerous locations across Boulder; check for more details. Jody Nagel put Boulder Granola on the market a little over a year ago. Her granola recipe came from her mom’s creation in the 1960’s. Jody wanted to capture Boulder’s values and persona in her granola, hence the name Boulder Granola. Boulder Granola’s tagline of “Unleash your inner hippie!” enhances the idea that Jody wanted to capture Boulder’s vibe in her product. Look for the bright, hippie Boulder Granola van around Boulder and you’ll get the essence. The cover of her granola is colorful with pictures creating a peace sign shaped heart. She is passionate about providing high standard product that is certified organic (sounds like Boulder, right?). She emphasized having her product 100% organic (more accurately 99.82%) is very important to her. Her philosophy is using simple, pure ingredients, and in Jody’s words, “We’re into really yummy eating.” Boulder Granola has 4 flavors right now, one of which is gluten free. Her flavors are original, cranberry, chocolate chip and gluten free original. Interestingly, the gluten free variety is their top seller. Boulder Granola flavors have organic non-fat dry milk as an ingredient, but the gluten free variety uses rice milk instead making it also dairy free. Boulder Granola is spread throughout various Boulder locations, even at unique places like Puddle Car Wash. Check the website for more information. Bulumu Granola is the creation of athlete co-founders Jasmine Oeinck and Brandon Bailey. Jasmine has always loved granola, Brandon used to hate it. Jasmine came up with Bulumu Granola creation after noticing most granolas were high in sugar and oil. She wanted to create a granola that tasted like it should: delicious, healthy and simple ingredients. So she created Bulumu Granola without adding any oils. After Brandon tried this granola, the once granola-hater was hooked. Bulumu focuses on using high integrity ingredients and unique flavor blends like red white + blueberry and orange ginger + cranberry. Brandon says their granola has grown slowly on purpose for a little over a year. They focus heavily on being a sustainable and low waste product. Boxes they use are made from 100% recycled material, they use rice paper bags for the granola and they donate 1% of all profits to a non-profit organization focusing on sustainability. Because of Brandon and Jasmine’s backgrounds, Bulumu has a niche in the athletic world. 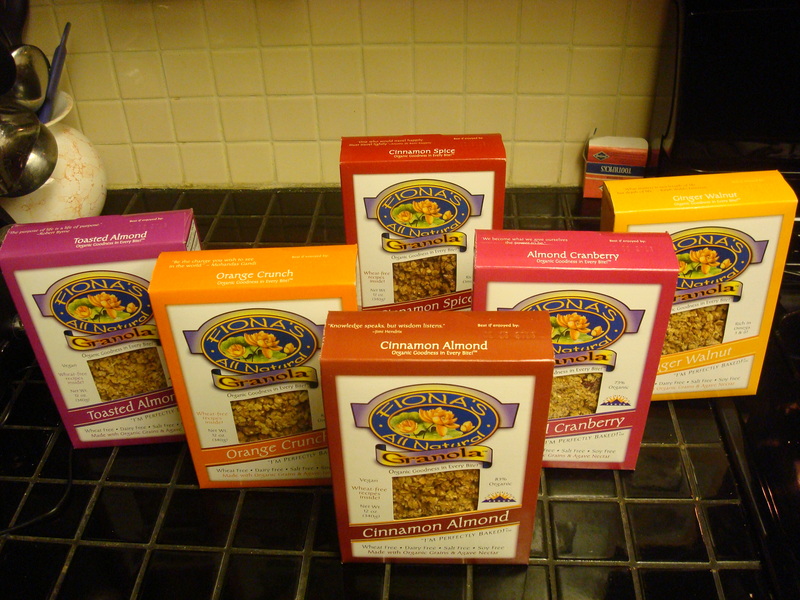 However, more people are noticing Bulumu Granola as a healthy, tasty option. What’s with the name? Jasmine and her family used to say Bulumu to each other while she was racing internationally. Bulumu is short for buckle up, love you, miss you. Bulumu’s tag line of “Fuel your passion. Live your adventure.” sums up Bulumu’s ideal message. How do you Bulumu? Find Bulumu at Whole Foods around Colorado, Utah, Kansas and on their website. Compared to a few granolas from larger corporations, granolas from Boulder are higher in calories, fat, fiber and lower in sugar. 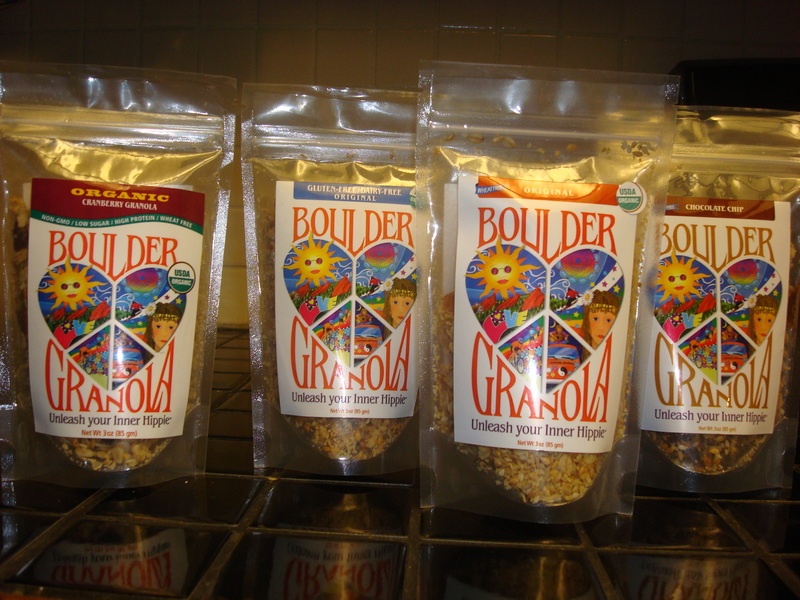 True to Boulder standards, Boulder based granolas all use high quality ingredients, no fillers, no artificial ingredients and non-GMO ingredients. Fiona’s and Boulder Granola use organic ingredients as well. Sugar: All three Boulder based granolas are sweetened naturally with agave nectar (Fiona’s and Bulumu), maple syrup and evaporated milk powder (Boulder Granola), fruit juice concentrate and honey (Bulumu) and dried fruit (all). Sugar from these sources are lower in glycemic index than white sugar. The other granola companies use white sugar and corn syrup for sweeteners. Fat and Calories: All of granolas from Boulder have a good amount of seeds and nuts which provide healthy unsaturated fats, omega 3 fatty acids and fat soluble vitamins. The nuts and seeds also increase the calorie content. 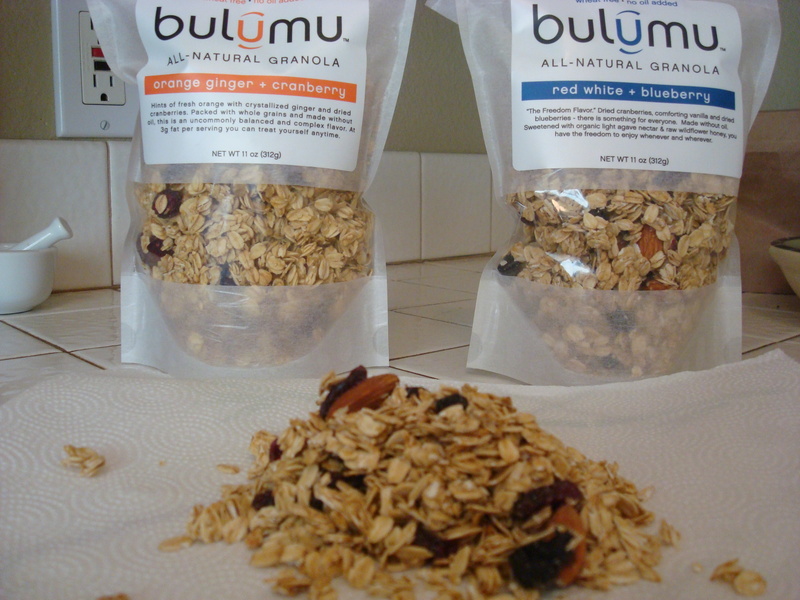 Bulumu adds no oils to their granola, hence the lower fat content of the Boulder based granolas. Kellogg’s and General Mills use palm oil (high in saturated fat) and sunflower oil as a fat source. Fiber: Boulder based granolas are higher in fiber from the oats, nuts, seeds and fruits. These 3 companies provide a granola that provides quality nutrition and all taste amazing while not being too sweet. Thank you to Fiona’s, Boulder Granola and Bulumu for interviewing and providing samples. If you know of a local product that you would like featured on Eat Drink Boulder, please contact us at info@Eat DrinkBoulder.com.